NASA announced the discovery of 715 new planets Wednesday. Our galaxy is looking far more crowded. NASA has confirmed a bonanza of 715 newly discovered planets outside our solar system. Scientists using the planet-hunting Kepler telescope have nearly doubled the number of planets discovered in the galaxy. The figure is now about 1,700. Twenty years ago, astronomers had not found any planets circling stars other than our sun. Astronomers used a new confirmation technique to come up with the largest batch of planets announced at one time. NASA made the announcement Wednesday. "We've almost doubled just today the number of planets known to humanity," Jack Lissauer, a planetary scientist at NASA's Ames Research Center who serves as the $600 million mission's co-investigator, told reporters during a teleconference, NBC News reported. 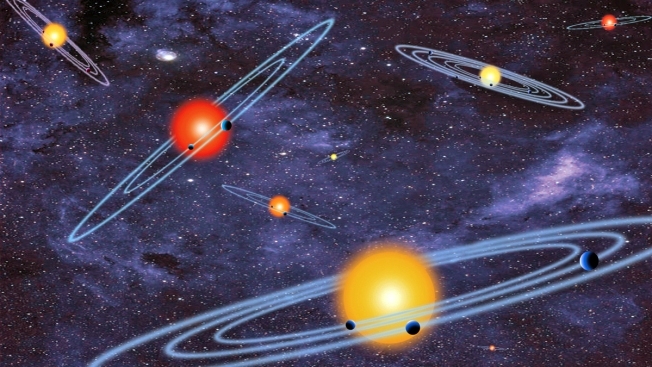 All the new planets are in systems like ours where multiple planets circle a star. Four of those new planets are in habitable zones where it is not too hot or not cold.